We need to solve the sun angles with some geometry. Note that true North from Roger's POV is past Tree 3, otherwise, we wouldn't see the shadow on Patty's back on the right side of Tree 3 (based on 12:20PM PST after a time zone correction for Bluff Creek). G: it appears that you are not using the NOAA site to compute the solar azimuth; if not, why not? It is intuitively apparent that PattyBob passed close behind tree 3. How close? Let us assume that PattyBob was traveling at a 41 degree angle to profile, with 41.5 inch steps, and took exactly 17 steps between frames 288 and 480. Let us further assume that the solar azimuth was 207.25 (10/20/67, 1330, film site) per NOAA site), and that Roger Patterson was filming from directly south of tree 3. Using other information from Giganto's composite image of PattyBob passing behind tree 3, how close to tree 3 did PattyBob walk, within an approximately 30% error? Specify any further assumptions. Because the NOAA appears to have the azimuth wrong for the PGF film site, Oct 20/1967, 1:20PM PDST. Here is what the shadows looked like from Roger's POV. And what makes you think Tree 3 was aligned North/South? Because if it wasn't your exercise is moot. G, why do you think it is incorrect, and what did you use to calculate the elevation and azimuth? My guess is that it's wrong because it doesn't account for daylight savings, which was in effect Oct 20, 1967. But that's your fault, not the NOAA's. I got the altitude and azimuth by punching in the coordinates & date/time into an astronomy app. The NOAA uses the same celestial mechanics algorithms to position the earth/sun. I actually discovered that last night after I posted. /red face. You show Patterson/camera facing about 15 degrees west of north. My estimates were just about that, maybe a little more north, but they were not at all rigorous. How did you come up with it? My 'exercise' is just that; I'm running through a few values to see what the error might be. While (as I suggested) the relative error may be large, in absolute terms it looks to be small. I am fascinated by the geometry here, and noticed that on your above diagram, it looks as if you place the subject of the PGF quite close behind a tree (which I think may be "tree 3", the third in a series of three, as seen from the camera perspective), which casts a shadow onto the subject. I believe this part of the "path" is shown in frames 413-426. If I have correctly identified the part of the "path" you are illustrating in your diagram above, can you approximate, by some relative means or approximation or distance, how close to the tree the subject walked? for example, "less than x number of tree diameters, or x number of body diameters, etc, or any other approximation? Any measurable distance of PGF subject to the second tree it passes behind, is only determinable after the sun angle is finalized, which it isn't yet. 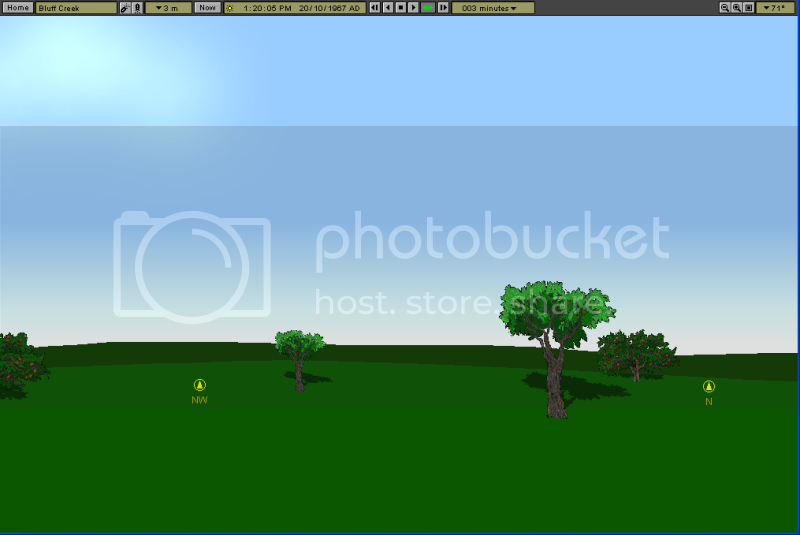 That's why I'm trying to nail down the sun angle relative to the landscape. Just wonderin', didn't Dahinden an Titmus both do drawin's of the sight that showed North. This sort of figurin' I don't do, so sorry if I'm wastin' time. Also, Murphy used used a photo of the sight from a plane or helicopter in Meet Sasq.. . Might be worth askin' him Bill, if the photo was cropped for his book, the original may show futher landmarks that could possibly be checked. Just a thought. I can't find any north indication in the Dahinden notes I have. I think Titmus did, but his whole diagram of the site is not consistant with other material, so I don't consider that relieble enough. But I'm open to anyone posting material from either man which they think is relaible in the North determination. I know...I'm almost positive Murphy used a photo from Rene, to come up with his 3d model of the site, the photo has distances of objects. I'm pretty sure it has N for north at top of photo(s,e an w as well). I have two of Murphys books, but I think it's in Meet the Sasquatch, on his makin' the model of site. I'll check later for you, or if you have his books. I don't know how to download stuff, sorry, terrible with tech stuff. 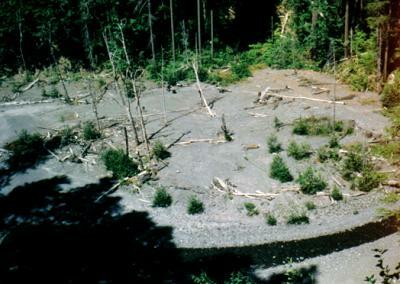 ps: The photo Murphy also used of the site takin' from the air as I mentioned, may hold clues if the actual photo wasn't cropped or zoomed in on for his book as well. Just a thought. Meet the Sasquatch, pg. #58 you'll find Renes photo of frame #352 with N. at top of image. Also, same book, pg. #56 has aerial photo of site taken in '71. I could email John Green, Peter Byrne an Daniel Perez if you'd like, see if they could be of help. Although I was chit-chatin' with John on the phone a couple weeks back just ta say hi, he kinda has his hands full with life so ta speak, might not hear back right away? Somewher along the way, I did check with all the sources you mentioned. I will review the book on Dahindin's image and note. Here is that photo. Rene Dahinden took it in 1971, according to Murphy. It is taken from the hillside, to the south of the film site, from an different angle east of Patterson's camera view. The second version is from Murphy, showing the location of the camera, subject and track-way. Hopefully this can help you all establish the north-orientation of the film site. I am no mathematician, so I'll leave that to the masters here. However, it seems to me that the shadows of the trees here (assuming afternoon) indicate that Dahinden's camera view was to the North-EAST. When we went down the hill to the area we believe to be the correct film site, as seen in my sketch map below, we came down from the road which is SOUTH of the film site. We came down from the south and east, heading north and slightly west, with the creek running generally EAST to WEST at that point. I'd estimate that our hike down was slightly to the east of Dahinden's position, though not that far, really. It looked pretty good in comparison when seen from above. Patterson when filming, then, would have headed generally NORTH at the start, and then turned EAST as the film subject retreated. 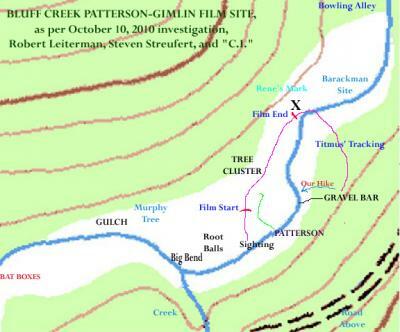 My sketch of the paths of Patterson and Patty are only sketched, not finally verified, please keep in mind; I should have Patterson starting closer to the "Sighting" spot, but sketched it in to the right a bit to avoid crowding. The gravel bar front and tree cluster we located are both found to the right side of the Dahinden photo, upper and lower corners. BTW... 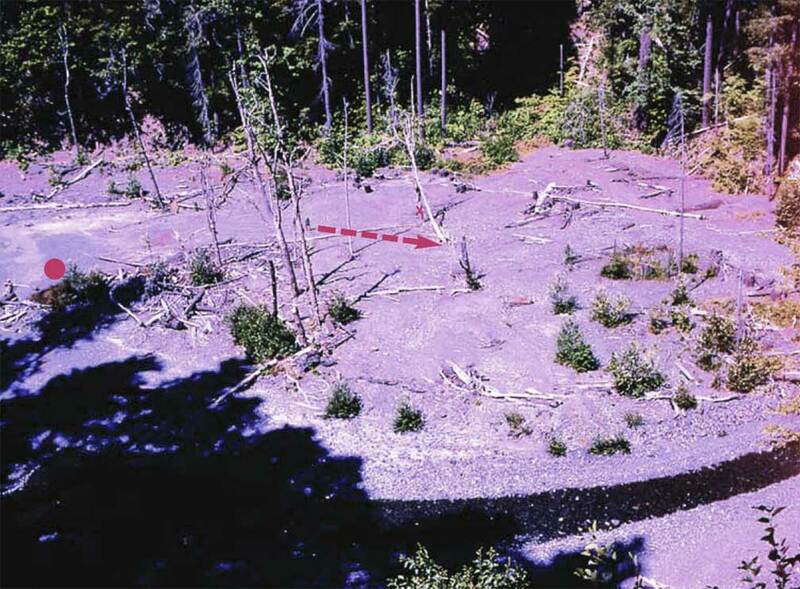 Many of the old researchers I've talked to about the situation of the site have spoken of the "EAST" and "WEST" sides of the creek, apparently forgetting that the upper part of Bluff Creek does not run north to south, as it does lower down at Louse Camp. Hope this helps, somehow. 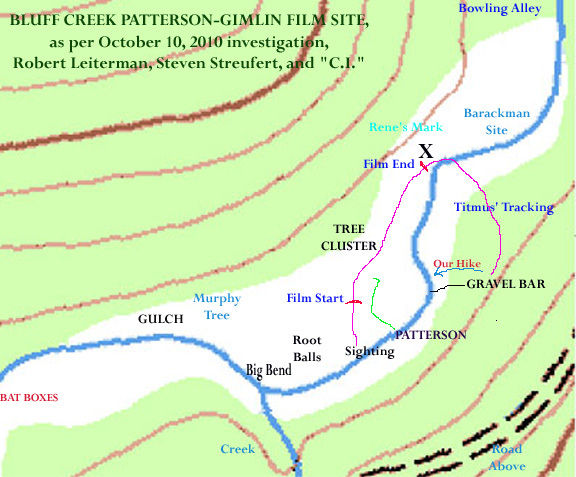 My associates would love to hear your opinion, as the location shown in the map here is the only one that we found plausible based on all the qualifying factors of the back-story (Gimlin's description), measured dimensions (Titmus, Dahinden and Green), and Dahinden's "aerial" photo. Watch for our video documentation on BFRO Videos on YouTube, coming soon!